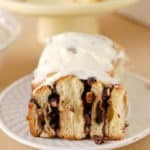 Looking for a weekend breakfast or brunch recipe? Once you make these Whole Grain Sourdough Waffles you’ll never go back to baking powder waffles again. Whenever we go out for breakfast I always find myself in an age old quandary. 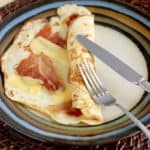 Do I go the bacon and eggs route, or the pancakes/waffles/french toast route? I usually end up ordering bacon and eggs because it’s hard to ruin them. I’ve been disappointed too many times by leaden pancakes or soggy waffles. Nothing is better for breakfast than hot and fresh waffles dripping with real maple syrup and maybe a pat of melting butter. But waffles must be eaten the minute they come off the waffle iron for maximum crunch. So I almost never order them out because they almost always disappoint. 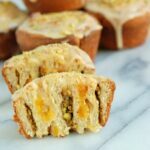 But why would you want to go out for breakfast when you can make these lovelies in the comfort of your own kitchen? They’re crisp and light yet substantial. 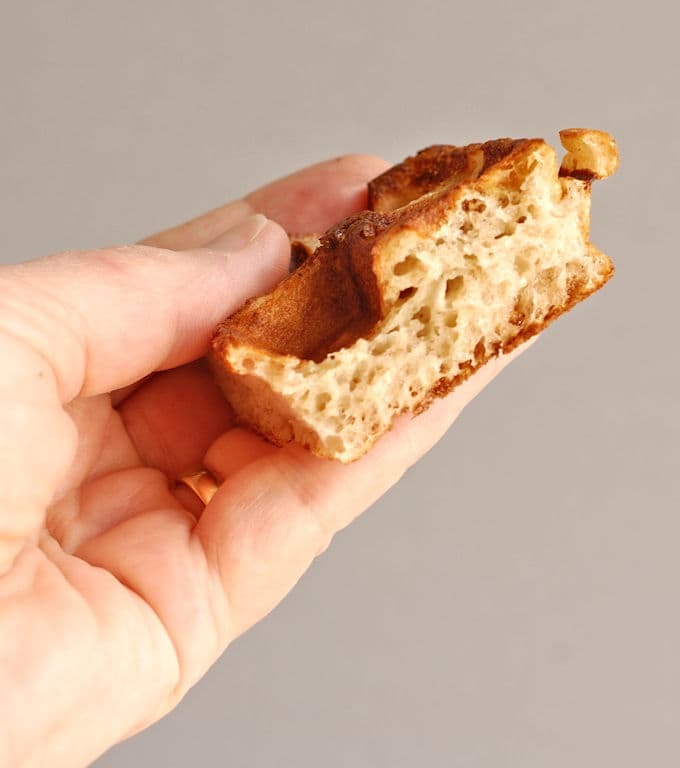 The sourdough starter and whole grains give the waffles a great bread-like chew, and the baking soda gives them a last minute lift for lightness. I’m not one to keep lots of extraneous single-use appliances in my kitchen, but a waffle iron is essential in my home. Even though I’m a baker by profession, I’m definitely not a morning person. That’s probably why I used to sell wedding cakes rather than donuts and croissants. 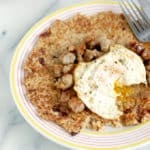 I prefer the least amount of work first thing in the morning so this recipe is great for me. I make the sponge the night before, then it takes about a minute to finish mixing the batter in the morning. If you keep a sourdough starter you know that each time you feed it it becomes active and rises up. 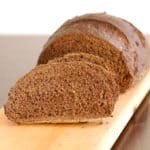 You’ll make your sponge the night before with the unfed starter and the sponge will be active and ready to mix by the time you wake up hungry for breakfast. The sponge will become active and rise overnight. The sourdough starter makes waffles with an open crumb and great chewy texture. A little baking soda is added to react with the buttermilk in the batter. For maximum lift use the batter as soon as the baking soda is mixed in because the reaction happens upon mixing, not in the heat of the waffle iron. Serve them hot off the iron or hold them in a 200°F oven if you prefer to serve them all at once. I always serve them hot off the iron for the ultimate crispness. The waffles freeze beautifully so extras can be placed in a freezer bag for another day. Just pop them in the toaster whenever the mood strikes. 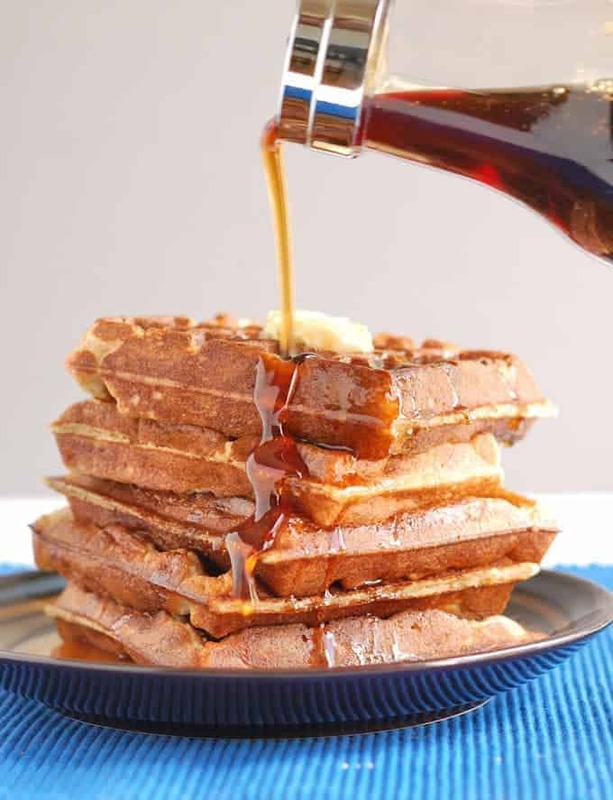 Serve these Whole Grain Sourdough Waffles with real maple syrup. I’m a fan of Grade B Maple Syrup‘s strong flavor (it’s sometimes called Grade A extra dark). 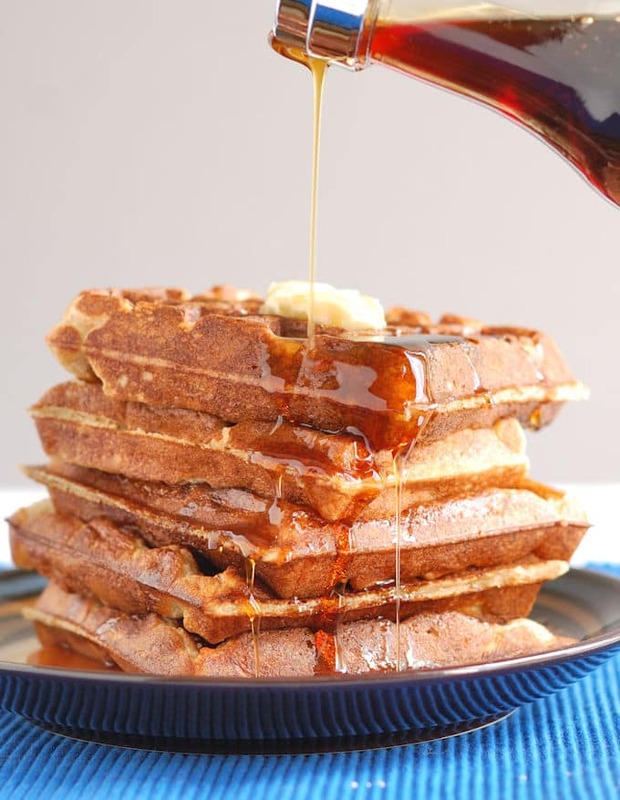 Start making Whole Grain Sourdough Waffles the night before and have hot fresh waffles for breakfast. Combine the starter, flour, sugar, and buttermilk. 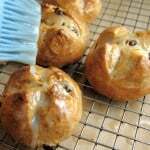 Cover with plastic wrap and leave at room temperature overnight. Mix until the baking soda and salt are completely dispersed in the batter. Make the waffles according to the waffle iron manufacturer's instructions. Serve waffles immediately or hold in a 200 F warm oven till ready to serve. The starter should be "un-fed" when you mix the sponge. 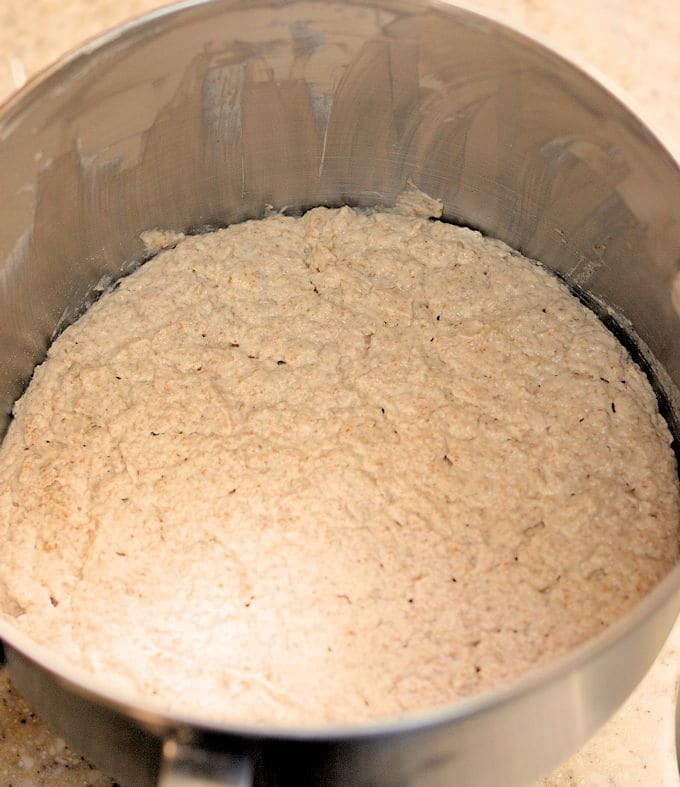 If you keep your starter in the refrigerator just take it out and mix the sponge. If you keep it out use the starter before the normal feeding. For a white waffle batter you can use 2 cups of all purpose flour in place of the 3 mixed flours. Or you can use 1 cup of the white and a cup of either the rye or whole wheat flour. 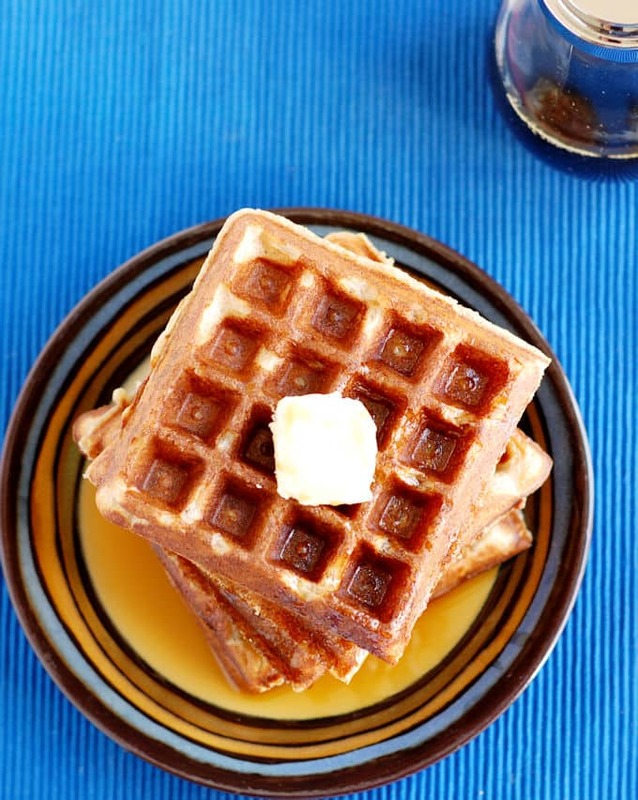 Leftover waffles can be frozen and reheated in the toaster. 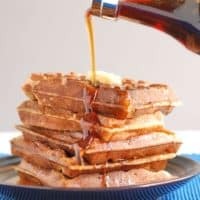 I’ve never tried sourdough waffles! What an amazing idea! I think I have to use my homemade sourdough starter to make them on the weekend. You’ll love them. So much better than regular waffles. Let me know how they turn out. I think these might be the perfect waffles! I usually make the “waffles of insane greatness” that are cornstarch based, but these have all the texture and much more flavor. Thanks! Thanks, MK. What I love about the sourdough waffles is the bready texture and chew. Enjoy!